As a journalist, I feel that it's my duty to provide you, the reader, with carefully researched columns that employ unbiased facts to present multiple sides of today's most complex issues. So today I'm going to use a lot of hyperbole and anecdotal evidence to write about German cars. I came up with the idea for today's column – that the only thing less reliable than a German car is a Happy Meal wristwatch – a few weeks ago while talking to a German friend. He told me, with absolutely no hint of irony in his voice (because Germans don't have the capacity for irony; just cleanliness), that modern German cars will "last forever." He was also stunned when I began violently coughing after several minutes of uncontrollable laughter. For some reason, Germans still believe this stuff. They actually think that modern German cars, which use the same technology for cruise control as our government uses to monitor the skies for impending nuclear warfare, will still be running perfectly in 20 years. I have two potential theories for why Germans feel this way. One is that Germans actually know the cars are crap, but they refuse to slander Germany, so they can't ever mention this. So they go home at night and lie awake thinking about how their power trunk closer has stopped working, and now they'll have to carry around their luggage in the backseat whenever a foreigner is nearby. The other theory is that these cars actually will live on, perfectly preserved, in Germany. This is because Germans always maintain things perfectly, in perpetuity, which is sort of contrary to how we behave here in America. For example: if a check engine light goes on in Germany, a German will rush to the dealership and have it fixed. Whereas an American will resolve the check engine light by a) going to Home Depot for some electrical tape to cover it up, and b) visiting McDonald's on the way home. But regardless of the reason, Germans really do think their cars are built to last forever. And here's the thing: it's not only Germans who feel this way. There's also a small contingent of Americans who will tell you – no matter how hard you argue against it – that German cars will last "a million miles" without ever needing a major service. These are usually the people who get a new S-Class every three years. Now, before we get into the reality of the situation, I'd just like to say that I understand where all of these perceptions of German car reliability come from. Mainly, they come from the old days, when German cars actually were more reliable than foreign rivals, and they were built like tanks, and evil dictators would cruise around in them because they could withstand nuclear attack and come out totally unscathed, except for those little flags mounted on the front bumpers. But let's be honest here, folks: this is no longer the case. And it hasn't been the case for a long time. For proof, I start with my own experience owning German cars. I've owned eight, in total: one from every important German automaker, and also Volkswagen. And they were all complete pieces of crap. OK, so maybe they weren't that bad. Oh, sure, the transmission died in one of them. And yeah, so I had to replace the ignition switch in another, and a differential in a third. There were failed window regulators, check engine lights, prematurely worn suspension components, and phantom tire pressure monitors. And my Mercedes G-Wagen suffered throttle response problems until I realized it was rusty enough to be a Civil War-era shipwreck. But they were great when they were working, right? Unfortunately, this is the greatest problem with German cars: they're never working. Oh, sure, they have relatively few problems for the first few years of ownership. (Technically defined as: "Right up until the Thursday after the warranty expires.") But even then, you're still losing an insane amount of money in depreciation. And once the depreciation curve starts to flatten, the problems start to crop up, which means you can't safely own a German car for more than an afternoon without spending as much money as round trip airfare to Bermuda. Of course, my own anecdotal experiences aren't my only evidence here. We also have years of JD Power Long Term Dependability Studies, which routinely place American or Japanese cars into the top dependability spots, while German cars go into entirely different categories, such as Broke Down on the Way to Test Facility. The main problem, as I see it, is that the Germans are just too obsessed with stuffing all sorts of newfangled gizmos into their cars. This is largely because no one questions the prowess of German engineering; they're still the best at that. So they continue to show their engineering dominance by creating all sorts of crazy gadgets and sticking them in the cars; stuff that no one wants, such as cooled gloveboxes, and rear armrest refrigerators, and those little tray tables that fold down, presumably to allow people riding in the back of an Audi A8 to do some cocaine. 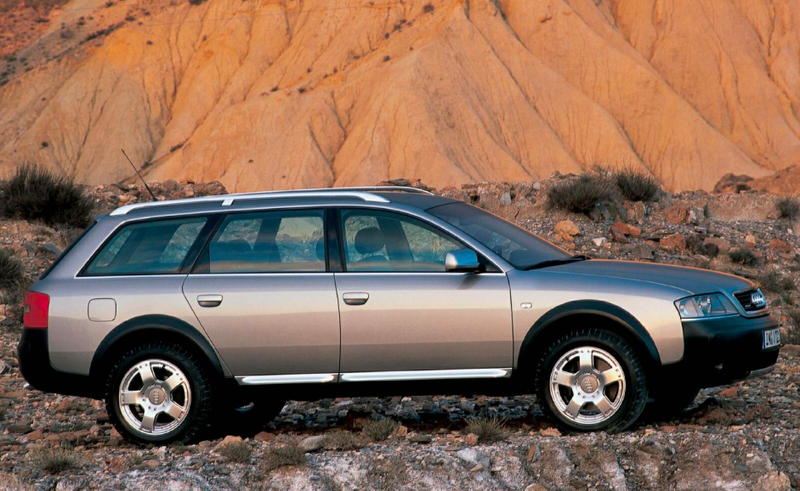 For a better example of this, I turn to the first-generation Audi Allroad, which was an all-wheel drive station wagon that went on sale here in America during the fall of 2000. While most companies would be content with simply building an all-wheel drive station wagon, Audi couldn't do just that. They had to do more. They couldn't just have normal suspension, for instance. They had to have adjustable suspension that would raise and lower to allow Connecticut families to traverse grass parking lots at lacrosse games. They couldn't just have a typical automatic transmission; it had to offer manual shifting capability. And they couldn't just have a regular V6 engine – they had to add two turbochargers. The result, as I'm sure you can imagine, is that the suspension failed, the transmissions went bad, and every single remaining V6 Allroad is currently leaking oil through its turbochargers, except the ones that are up on blocks because of bad suspension and a blown transmission. All of this, by the way, was in addition to your usual set of Audi problems, such as – this one actually happened to me – turn signals that don't blink, but rather stay lit when you press the lever. For this reason, I have taken to measuring automotive reliability on a scale I've dubbed the "Audi Allroad Scale Of Unreliability," which rates cars based on how close they are to the original Audi Allroad in terms of potential for random four-figure maintenance bills. For example: the Lexus ES300 is pretty low on the Audi Allroad Scale Of Unreliability. Whereas a vehicle made entirely by chimpanzees provided with random car parts would be almost as bad as the Allroad. Maybe even worse if the chimpanzees are German.